General Kip Ward the Commanding General of the United States Africa Command (AFRICOM) recently was in the region on one of his missions. He Made Several Stops in Africa including a Couple of High Profile Meetings in Kigali and Kinshasa. How did this Mission Turn out? During the 1990s The Reaction by the United States to several High Profile Crises in Africa received copious and in at least one case justified criticism. The One Attempt to have US Troops on the Ground in a Peacekeeping Capacity ended with the Humiliation of a Administration. Then in the Middle Part of the Decade the Crisis Spots grew both in number and in the verocity of the attacks. First there was Rwanda, Then Sierra Leone, then It was the Democratic Republic of the Congo followed by Ivory Coast and Liberia. Now the Buzzwords are Darfur, the Niger Delta, Zimbabwe and again Somalia and the DRC. Since the United States imports roughly 30% of its Petroleum from the Niger Delta, Religous Extremism will be a problem for the forseeable future, the Piracy Issues in both the Gulf of Guinea and in the Gulf of Aden it is clear that the US will need to have a presence in Africa. Hence AFRICOM was created in 2007 by the Pentagon under the Orders of President Bush. 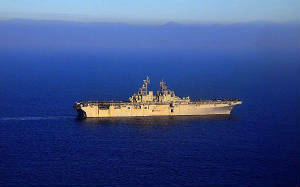 The USS Boxer shown recently off the Coast of Africa. While He was on His Most Recent Visit to Africa General Ward stopped in two Countries which have an emphasis of how the Previous Administration viewed Africa. His First Stop was in Rwanda. The Government of Paul Kagame has received substantial amounts of Aid from the United States. The US Air Force assists in Providing Logistical Support for the Rwandan Peacekeepers in Darfur. Earlier this year Rwandan Troops supported FARDC in an effort to rein in the Forces of the FDLR in the Eastern DRC. They also took into custody General Nkunda another Warlord with a large following in the Eastern DRC. Speaking of the Congo: While He was the Congo General Ward Made the Call for the Country to have a Professional Army. When President Kabila visisted the US in 2007 He received an offer from the US to train the Non-Commissioned Officers as well as the Officer Corps. Having the US train both of these Components will be a boon for FARDC. It is believed that the number of Human Rights Atrocities committed by the Army will hopefully diminish as well. General Ward also stopped at the CENTCOM Land Forces Symposium in Mombasa,Kenya as well. The Confused Eagle Will Monitor this Situation.